My dripped on and scratched through, acrylic-on-wood paintings are often inspired by a synthesis of dust filled, graffiti strewn, worn out life in the contemporary urban Southwest, and the neo primitive and abstract expressionist traditions of the mid 20th Century. This collision of time and influence results in richly layered images that create a bright and gritty New Southwest. My sunset palettes and playful mark making are often balanced by contemplative undertones and result in paintings that are intuitive, visceral, process driven and relevant to today’s audience. Isaac AlaridPease was raised in a century old adobe home in Abiquiu, NM. 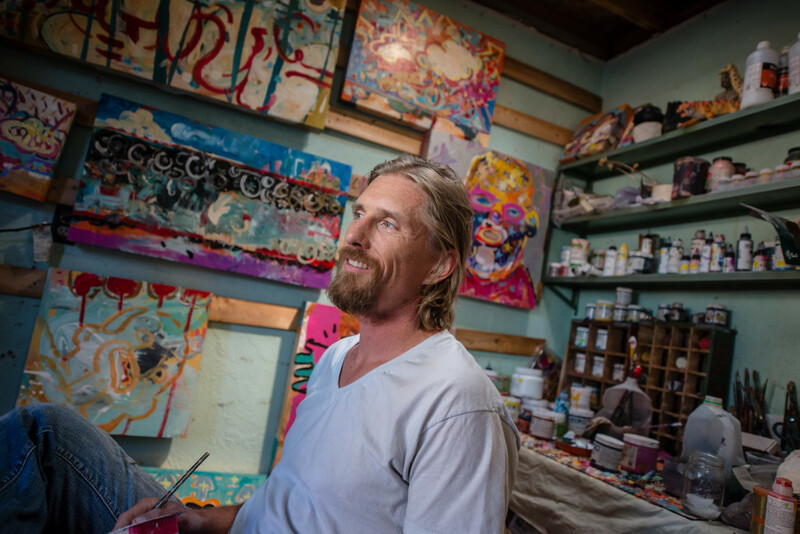 His urban folk art style originates in his childhood penchant for cartooning and is inspired by naive art traditions and living in Albuquerque, NM . AlaridPease earned his BFA in 1998 and MA in Art Education in 2013 from UNM. He has taught classes in Albuquerque, NM; Ciudad de Puebla, Mexico and at Anderson Ranch in Snowmass, CO. He has been a part of various group shows including exhibits at Visiones Gallery and 516 Arts in Albuquerque and is currently represented by Rising Moon Gallery in Abiquiu, NM.